The station is located at the heart of the airport campus, which means passengers have easy access to all the terminals. With moving walkways throughout, it should take no more than 5 - 15 minutes to get to and from the terminals. Trains from Manchester Airport to Manchester Piccadilly station in the city centre take around 20 minutes. They run every 10 minutes, 7 days a week, through train operators TransPennine Express and Northern Rail. Meanwhile, you can travel to just about anywhere in the UK from Manchester Piccadilly. Save money by pre-booking your train tickets online on the official Manchester Airport website. You can also buy train tickets online for travel that day, or there are ticket machines and an information desk at the Manchester Airport train station. Those in need of accessibility services can find plenty of help around the station. Can I take my bike on board? Most trains have a dedicated area for storing bicycles. Bikes are stored free of charge and can be booked in advance. You can take your bike without booking in advance, but space will be allocated on a first come first served basis. Please contact the train operator for more information. Can I buy a ticket on the day? Yes. You can buy tickets online, or at the ticket machines or rail information desk located at The Station. Which terminal is the station at Manchester Airport? Manchester Airport Train Station is situated between Terminal 1 and Terminal 3, although is within walking distance of all three terminals. Lifts, escalators and moving walkways connect the train station and terminal buildings. Overhead signs will help guide you through the airport. What if my plane is delayed and I miss my train? We advise that you factor in extra time during your journey to allow for delays and other unforeseen circumstances. 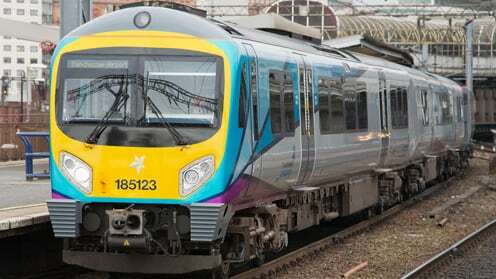 Some train operators – for example, TransPennine Express – allow you to use an alternative service (up to 3 hours later) should you miss your train. However, we advise that you contact the train operator you’re travelling with to check their policy. Do trains go direct to Manchester Airport? There are a large variety of train services that run directly to and from Manchester Airport train station on a daily basis. Travel to and from cities all around the UK, making your journey to the airport as simple as possible. Plan your journey today and get ticket prices online with our official partner. What time is the first and last train from Manchester Airport? The first train to depart from the airport to Manchester City Centre is at 04:12 although, Manchester Airport Train Station has strong connections around the UK so the first train time departure is dependant on destination. The last train service departing Manchester Airport leaves at 01:34am and travels to Manchester Piccadilly. Train times and services will vary depending on destination and time of travel, however the final services of the day usually run at similar times. For all train time tables, please visit Trainline. How many platforms does Manchester Airport train station have? Manchester Airport train station has four platforms and is located in the centre of the airport ; with all three terminals within a 10-minute walking distance. There are a variety of service boards throughout the station in which you can find further information about train services on each platform. You’ll also be able to purchase refreshments before you board your train. Can you pick up at Manchester Airport train station? Pick up and drop off options are available close to Manchester Airport train station; usually within a short walk. Please be aware that the pick up and drop off stations now incur a charge of £3 for 5 minutes and £4 for 10 minutes, short stay parking is also available near the station. Please visit drop off and pick up page for more information.